After the Poor Law Union was re-organized in 1891, the parish was in the Grantham North sub-district of the Grantham Registration District. The Lincolnshire Family History Society has published surname indexes on fiche or in booklet form for each of these census years under the title "Grantham". Please note that these are SURNAME indexes only, and do not show first names, age or relationships. 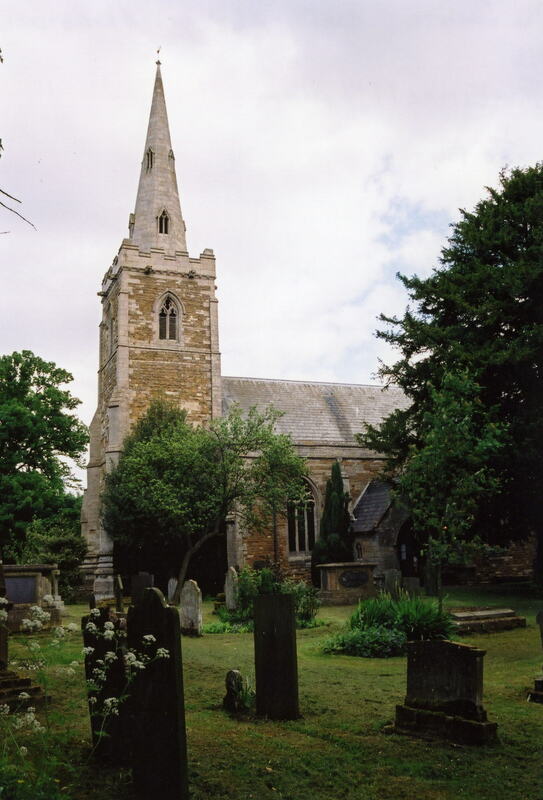 You can also perform a more selective search for churches in the Barrowby area or see them printed on a map. The Anglican parish church is dedicated to All Saints, built in the gothic style. The church was extensively restored in 1852 and an organ chamber added in 1870. The church was further restored in 1889-90. Richard CROFT has a photograph of All Saints Church on Geo-graph, taken in December, 2007. Anglican Parish registers exist from 1538. Bishop's transcripts exist from 1562 to 1842. Barrowby marriages from 1651-1750 are covered in Boyd's Marriage Index, and from 1790-1837 in Pallot's Marriage Index. Parish registers are on file at the Society of Genealogists, covering 1538 - 1837. The LFHS has published several indexes for the Grantham Deanery to assist in your searches. Those researching the ALLEN/ALLIN surname will want to check our parish register extract. Your additions are welcome. The Independent (later "Free") Methodists had a small chapel here, built in 1840. The Wesleyan Methodists built theirs a few years later. For information and assistance in researching these chapels, see our non-conformist religions page. This village and parish are just west of Grantham. Harlaxton parish lies to the south, Woolsthorpe and Denton parish to the southwest and Muston, in Leicestershire, lies to the west. The parish covers about 4,400 acres. The parish also included the hamlet of Casthorpe, which by 1841 consisted of only three farms. Take the A1 Motorway to Grantham. This road curves around the west side of Grantham, where it connects to the A52 Trunk Road. Take the A52 west about 1/4 mile and turn south to Barrowby. David HARRIS has a photograph of the Village Sign on Geo-graph, taken in July, 2008. Keep an eye open for it! David DIXON goes him one better with a close-up of the Village Sign on Geo-graph, taken in September, 2013. Ask for a calculation of the distance from Barrowby to another place. You can see the administrative areas in which Barrowby has been placed at times in the past. Select one to see a link to a map of that particular area. Dr. HURST died here in 1687. 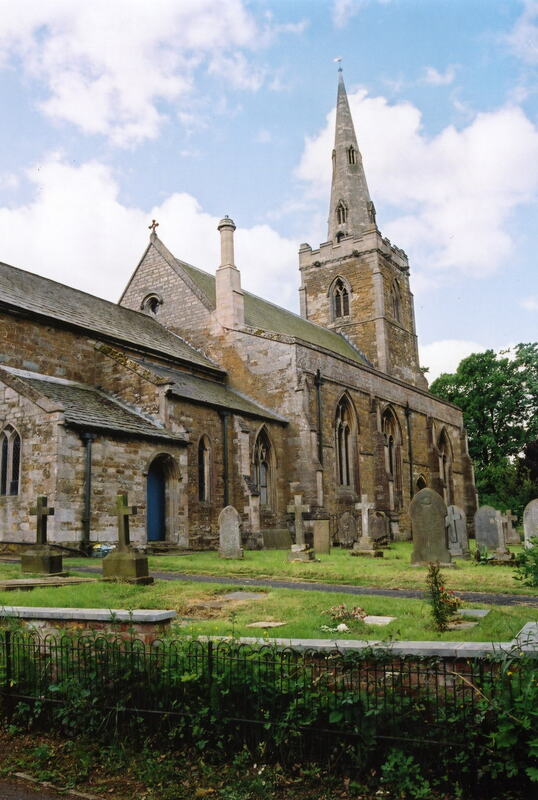 He was a famous rector of Barrowby and Leadenham who became chaplain to Charles I. He was "plundered, imprisoned and ejected" due to his loyalty to the king. In 1841, roughly half the parish belonged to the Duke of Devonshire, who was lord of the manor. Sir J. C. THOROLD owned about one-quarter of the land and the rest belonged to the WELBY and other families. In 1872, things hadn't changed much. Roughly half the parish belonged to the Duke of Devonshire, lord of the manor. Sir J. H. THOROLD, baronet, owned about one-quarter of the land and the rest belonged to the WELBY, KELHAM and other families. In 1913, still half the parish belonged to the Duke of Devonshire, still lord of the manor. Sir John H. THOROLD, baronet, owned about one-quarter of the land and the rest belonged to the WELBY and other families. By 1842, Barrowby Hall had been reduced to a farm house and the surrounding moat drained and filled in. In 1872, the ancient hall was occupied by Mr. Thomas PINDER. Note: There is a Barrowby Hall in Nottinghamshire as well. In the church is a large bronze tablet with the names of the men who died in World War I. In 1930 Lt.-Col. Robert C. SWAN resided at Barrowby Grange. The name derives from the Old Scandinavian berg+by, meaning "village on the hill". It appears as Bergebi in the 1086 Domesday Book. It is presumed that the Vikings founded Barrowby, but that is as yet unproven. White's 1842 Directory lists the following surnames in the parish: ANNIS, ARCHER, ASHWELL, BULLIMORE, DAWN, DICKINSON, DOWNING, EMINSON, FREEMAN, FRIESTON, GARTON, GIBSON, IRELAND, JACKSON, JENKINSON, JOHNSTON, KENDAL, KING, KITTLE, MILLHOUSE, MORRIS, NELSON, PEARSON, PINDER, RICKITT, SAVIDGE, SHARP, SILLS, SMITH, STEPHENSON, TAYLOR, TROLLEY, VINCENT, WALFORD and WALKER. Kelley's 1913 Directory lists the following surnames in the parish: BLANKLEY, BLOODWORTH, BREWSTER, BRIGGS, BROOKS, BROWNLOW, BURROWS, DOWNING, FOYSTER, GASCOIGNE, GRIFFIN, GRIET, HOMES, HORNSBY, HULL, INGRAM, JARVIS, JUDSON, LYNN, MURGATROID, MUSSON, NATION, NAYLOR, NEWTON, PATMAN, PEARSON, PELL, PINDER, SHARP, SMIS, SMITH, STRANGE, SWALLOW, TATCHELL, TINKLER, WELBY, WIKSON and WOOMER. The parish was in the ancient Loveden Wapentake in the South Kesteven district in the parts of Kesteven. Prior to the 1830s it had been in the Winnibriggs & Threo Wapentake. Lewis SOMERSALL and Thomas HURST, DD, donated rent-charges of 20 shillings each to go to the poor. Prior to 1842, various donors left £130, the interest to go to poor parishioners. As a result of the Poor Law Amendment Act of 1834, the parish became part of the Grantham Poor Law Union. A new school was first erected here in 1852. A Public Elementary School was erected about 1880 to hold 190 children.